This approach is recommended for customers with a dedicated cluster for use of the solution or a security data lake; it takes advantage of existing investment in hardware and software. The disadvantage of this approach is that it does require the installation of software on Hadoop nodes not managed by systems like Cloudera Manager. This version of the installation guide has been validated for clusters with HDFS running Hadoop. NOTE: Spot requires Spark 2.1.0 if you are using Spark 1.6 please upgrade your Spark version to 2.1.0.
spot-setup — scripts that create the required HDFS paths, hive tables and configuration for apache spot (incubating). spot-ingest — binary and log files are captured or transferred into the Hadoop cluster, where they are transformed and loaded into solution data stores. spot-ml — ​machine learning algorithms are used for anomaly detection. spot-oa— data output from the machine learning component is augmented with context and heuristics, then is available to the user for interacting with it. While all of the components can be installed on the same server in a development or test scenario, the recommended configuration for production is to map the components to specific server roles in a Hadoop cluster. 3.1 Create a user account for apache spot (incubating). Before starting the installation, the recommended approach is to create a user account with super user privileges (sudo) and with access to HDFS in each one of the nodes where apache spot (incubating) is going to be installed ( i.e. edge server, yarn node). For unattended execution of the ML pipeline, a public key authentication will be required. Log on to the first ML node (usually the lowest-numbered node). and create a private key for the solution user. Then you will need to copy those credentials to each node used for ML. The sample above assumes that the solution-user is “soluser” and there are 12 nodes used for ML. Now do the same for the UI node. Go to the download page here and go to click in "Download Apache Spot". 3.3 Edit apache spot (incubating) configuration. NOTE: deprecated keys will be removed in the next releases. Copy the configuration file edited in the previous step to "/etc/" folder. Copy the configuration to the two nodes named as UINODE and MLNODE. Run the hdfs_setup.sh script to create folders in Hadoop for the different use cases (flow, DNS or Proxy), create the Hive database, and finally execute hive query scripts that creates Hive tables needed to access netflow, DNS and proxy data. Copy the ingest folder (spot-ingest) to the selected node for ingest process (i.e. edge server). If you cloned the code in the edge server and you are planning to use the same server for ingest you dont need to copy the folder. Create a src folder to install all the dependencies. Install pip - python package manager. kafka-python (how to install) -- Python client for the Apache Kafka distributed stream processing system. watchdog - (how to install) Python API library and shell utilities to monitor file system events. spot-nfdump - netflow dissector tool. This version is a custom version developed for apache spot (incubating) that has special features required for spot-ml. sudo yum -y install gtk2-devel gtk+-devel bison qt-devel qt5-qtbase-devel sudo yum -y groupinstall "Development Tools"
screen -- The screen utility is used to capture output from the ingest component for logging, troubleshooting, etc. You can check if screen is installed on the node. If screen is not available, install it. Spark-Streaming – Download the following jar file: spark-streaming-kafka-0-8-assembly_2.11. This jar adds support for Spark Streaming + Kafka and needs to be downloaded on the following path: spot-ingest/common (with the same name). Currently spark streaming is only enabled for proxy pipeline, if you are not planning to ingest proxy data you can skip this step. dbname: Name of HIVE database where all the ingested data will be stored in avro-parquet format. hdfs_app_path: Application path in HDFS where the pipelines will be stored (i.e /user/application_user/). kafka: Kafka and Zookeeper server information required to create/listen topics and partitions. collector_processes: Ingest framework uses multiprocessing to collect files (different from workers), this configuration key defines the numbers of collector processes to use. pipelines: In this section you can add multiple configurations for either the same pipeline or different pipelines. The configuration name must be lowercase without spaces (i.e. flow_internals). Copy ML code to the primary ML node, the node will launch Spark application. Install sbt -- In order to build Scala code, a SBT installation is required. Please download and install download. Copy spot-oa code to the OA node designed in the configuration file (UINODE). spot-ml results. Operational Analytics works and transforms Machine Learning results. The implementation of Machine Learning in this project is through spot-ml. Although the Operational Analytics is prepared to read csv files and there is not a direct dependency between spot-oa and spot-ml, it's highly recommended to have these two pieces set up together. If users want to implement their own machine learning piece to detect suspicious connections they need to refer to each data type module to know more about input format and schema. OA installation consists of the configuration of extra modules or components and creation of a set of files. Depending on the data type that is going to be processed some components are required and other components are not. If users are planning to analyze the three data types supported (Flow, DNS and Proxy) then all components should be configured. Add a file iploc.csv: Ip localization file used by OA when running data type Flow. Create a csv file with ip ranges in integer format and give the coordinates for each range. The spot-setup project contains scripts to install the hive database and also includes the main configuration file for this tool. The main file is called spot.conf which contains different variables that the user can set up to customize their installation. Some variables must be updated in order to have spot-ml and spot-oa working. To run the OA process it's required to install spot-setup. If it's already installed just make sure the following configuration are set up in spot.conf file (oa node). LUSER: represents the home folder for the user in the Machine Learning node. It's used to know where to return feedback. HUSER: represents the HDFS folder. It's used to know from where to get Machine Learning results. IMPALA_DEM: represents the node running Impala daemon. It's needed to execute Impala queries in the OA process. DBNAME: Hive database, the name is required for OA to execute queries against this database. Configure components. Components are python modules included in this project that add context and details to the data being analyzed. There are five components and while not all components are required to every data type, it's recommended to configure all of them in case new data types are analyzed in the future. For more details about how to configure each component go to spot-oa/oa/components/README.md. "oa_data_engine": Whichever database engine you have installed and configured in your cluster to work with Apache Spot (incubating). i.e. "Impala" or "Hive". For this key, the value you enter needs to match exactly with one of the following keys, where you'll need to add the corresponding node name. "impala_daemon": The node name in your cluster where you have the database service running. Apache Spot (incubating) - User Interface (aka Spot UI or UI) Provides tools for interactive visualization, noise filters, white listing, and attack heuristics. Here you will find instructions to get Spot UI up and running. For more information about Spot look here. With root privileges, install browserify and uglify as global commands on your system. Install dependencies and build Spot UI. Access the analyst view for Suspicious Connects http://"server-ip":8889/files/ui/flow/suspicious.html. Select the date that you want to review (defaults to current date). By selecting a specific row within the Suspicious frame, the connection in the Network View will be highlighted. Located at the top right corner of the Suspicious Connects Web Page. It is a graphical representation of the Suspicious records relationships. 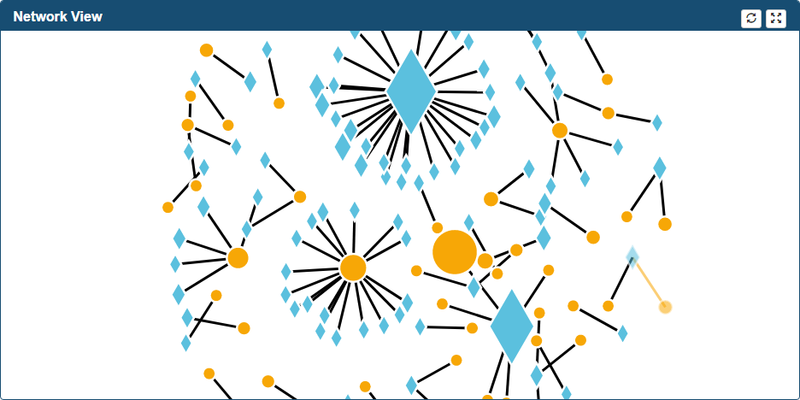 If context has been added, Internal IP Addresses will be presented as diamonds and External IP Addresses as circles. As soon as you move your mouse over a node, a dialog shows IP address information of that particular node. 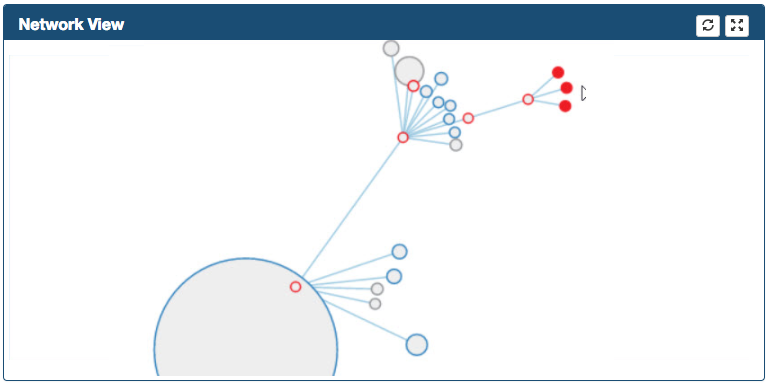 A primary mouse click over one of the nodes will bring a chord diagram into the Details frame. The chord diagram is a graphical representation of the connections between the selected node and other nodes within Suspicious Connects records, providing number of Bytes From & To. You can move your mouse over an IP to get additional information. In addition, drag the chord graph to change its orientation. A secondary mouse click uses the node information in order to apply an IP filter to the Suspicious Web Page. This frame contains a section where the analyst can score IP Addresses and Ports with different values. In order to assign a risk to a specific connection, select it using a combination of all the combo boxes, select the correct risk rating (1=High risk, 2 = Medium/Potential risk, 3 = Low/Accepted risk) and click Score button. Selecting a value from each list will narrow down the coincidences, therefore if the analyst wishes to score all connections with one same relevant attribute (i.e. src port 80), then select only the combo boxes that are relevant and leave the rest at the first row at the top. When the Analyst clicks on the Score button, the action will find all coincidences exactly matching the selected values and update their score to the rating selected in the radio button list. This box allows the Analyst to enter an IP Address and scored using the "Score" and "Save" buttons using the same process depicted above. Access the analyst view for suspicious connects http://"server-ip":8889/files/ui/flow/suspicious.html. Select the date that you want to review. The analyst must score the suspicious connections before moving into Threat Investigation View, please refer to Suspicious Connects Analyst View walk-through. Select Flows > Threat Investigation from apache spot (incubating) Menu. 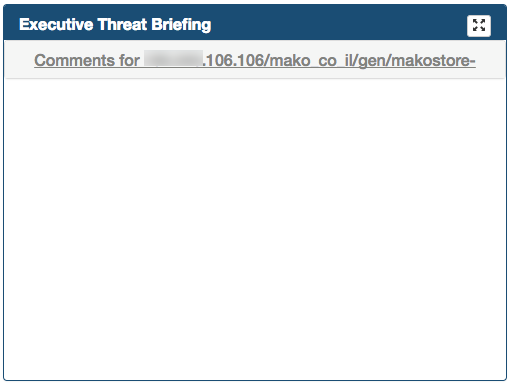 Threat Investigation Web Page will be opened, loading the embedded IPython notebook. The full output of this query is stored into the flow_threat_investigation table. Top 'n' IP's per number of connections. Top 'n' IP's per bytes transferred. The number of results stored in the dictionaries (n) can be set by updating the value of the top_results variable. In addition, a web form is displayed under the title of 'Threat summary', where the analyst can enter a Title & Description on the kind of attack/behavior described by the particular IP address that is under investigation. Click on the Save button after entering the data to write it into the flow_storyboard table. Map view - create a globe map indicating the trajectory of the connections based on their geolocation. Impact analysis - This will represent the number of inbound, outbound and twoway connections found. 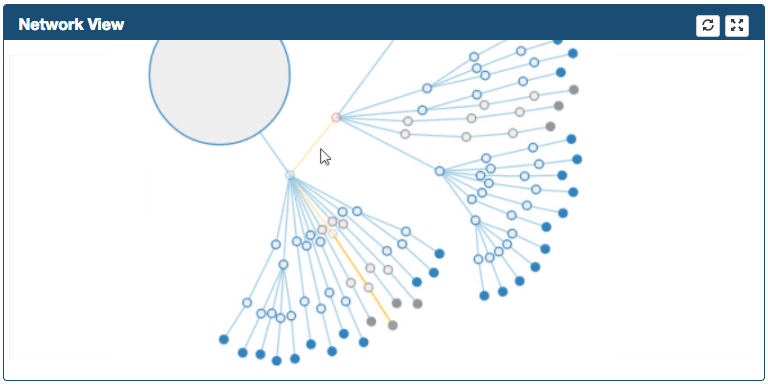 Dendrogram - This represents all different IP's that have connected to the IP under investigation, this will be displayed in the Storyboard under the Incident Progression panel as a dendrogram. If no network context file is included, the dendrogram will only be 1 level deep, but if a network context file is included, additional levels will be added to the dendrogram to break down the threat activity. 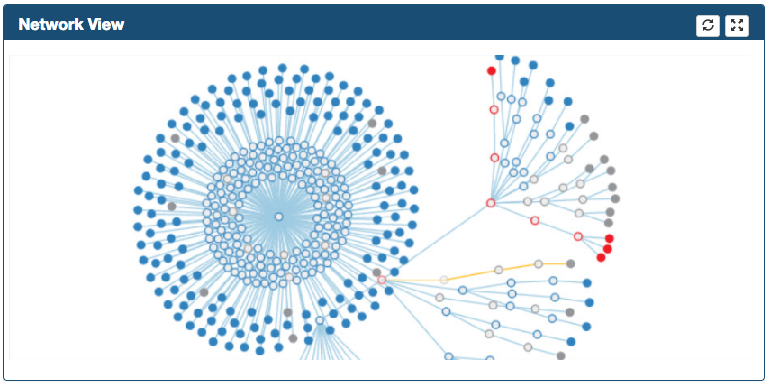 Timeline - This represents additional details on the IP under investigation and its connections grouping them by time; so the result will be a graph showing the number of connections occurring in a customizable timeframe. Executive threat briefing - Here the comments for the IP are displayed as a menu under the 'Executive Threat Briefing' panel. Once you have saved comments on any suspicious IP, you can continue to the Storyboard to check the results. Select the option Flow > Storyboard from Apache Spot (incubating) Menu. Your view should look something like this, depending on the IP's you have analyzed on the Threat Analysis for that day. You can select a different date from the calendar. Executive Threat Briefing lists all the incident titles you entered at the Threat Investigation notebook. You can click on any title and the additional information will be displayed. Clicking on a threat from the list will also update the additional frames. Incident Progression displays a tree graph (dendrogram) detailing the type of connections that conform the activity related to the threat. When network context is available, this graph will present an extra level to break down each type of connection into detailed context. Impact Analysis displays a horizontal bar graph representing the number of inbound, outbound and two-way connections found related to the threat. Clicking any bar in the graph, will break down that information into its context. Map View Globe will only be created if you have a geolocation database. This is intended to represent on a global scale the communication detected, using the geolocation data of each IP to print lines on the map showing the flow of the data. Timeline is created using the resulting connections found during the Threat Investigation process. 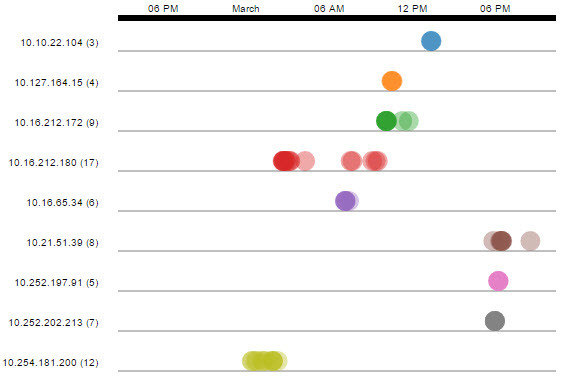 It will display 'clusters' of inbound connections to the IP, grouped by time; showing an overall idea of the times during the day with the most activity. You can zoom in or out into the graphs timeline using your mouse scroll. Load the Ingest Summary page by going to http://"server-ip":8889/files/index_ingest.html or using the drop down menu. 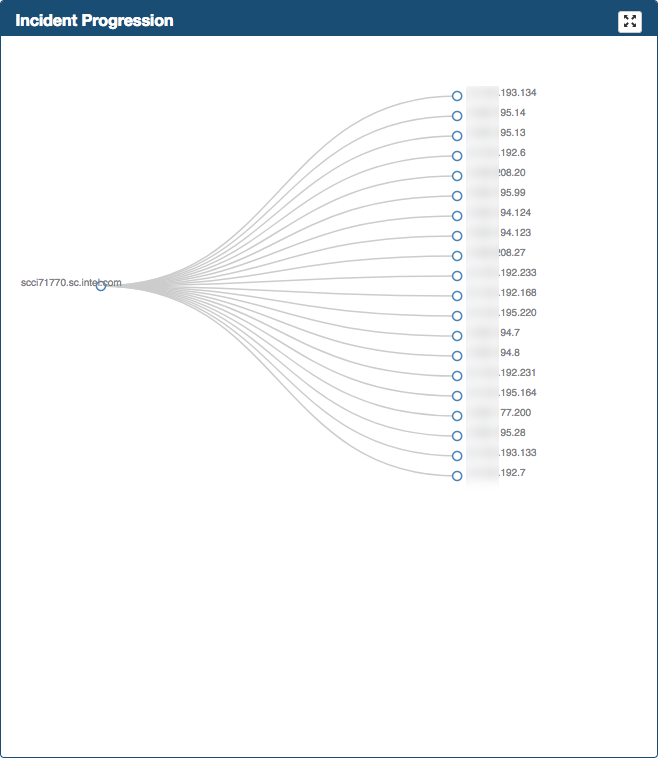 Ingest Summary presents the Flows ingestion timeline, showing the total flows for a particular period of time. Analyst can zoom in/out on the graph. By default, the ingested data for netflow will be displayed. If you want to review a different pipeline, you can change the selection in the dropdown list at the top of the page. 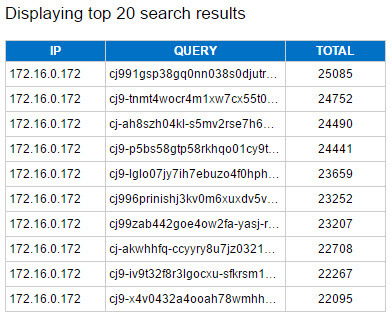 Open the analyst view for Suspicious DNS: http://"server-ip":8889/files/ui/dns/suspicious.html. Select the date that you want to review (defaults to current date). Located at the top left of the Web page, this frame shows the top 250 suspicious DNS from the Machine Learning (ML) output. By moving the mouse over a suspicious DNS, you will highlight the entire row as well as a blur effect that allows you to quickly identify current connection within the Network View frame. Shield icon. Represents the output for any Reputation Services results that has been enabled, user can mouse over in order to obtain additional information. The icon will change its color depending upon the results from specific reputation services. 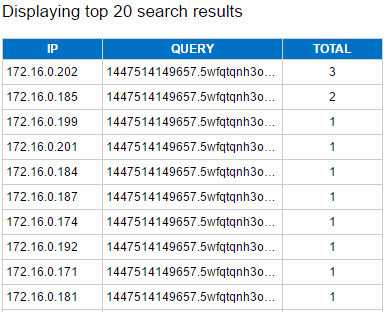 By selecting on a Suspicious DNS record, you will highlight current row as well as the node from Network View frame. In addition Details frame will be populated with additional communications directed to the same DNS record. Located at the top right corner, Network View is a graphic representation of the "Suspicious DNS". As soon as you move your mouse over a node, a dialog shows up providing additional information. A secondary mouse click uses the node information to filter suspicious data. Located at the bottom right corner of the Web page. It provides additional information for the selected connection. Table details (when you select a record in the Suspicious frame). The main function in this frame is to allow the Analyst to score IP Addresses and DNS records with different values. In order to assign a risk to a specific connection, select it using a combination of all the combo boxes, select the correct risk rating (1=High risk, 2 = Medium/Potential risk, 3 = Low/Accepted risk) and click Score button. Selecting a value from each list will narrow down the coincidences, therefore if the analyst wishes to score all connections with one same relevant attribute (i.e. ip address 10.1.1.1), then select only the combo boxes that are relevant and leave the rest at the first row at the top. Pressing the 'Score' button will find all exact matches of the selected threat (Client IP or Query) in the dns_scores table to set their severity value to the one selected. Selecting values from both the "Client IP" and "Query" lists to score them together, will update every matching threat individually with the same rating value, but not necessarily as a Client_IP-Query pair. You can score a large set of similar or coincident queries by entering a keyword in the "Quick Scoring" text field and then select a severity value from the radiobutton list. The value entered here will only search for matches on the dns_qry_name name column. "Quick Scoring" text field has precedence over any selection made on the lists. 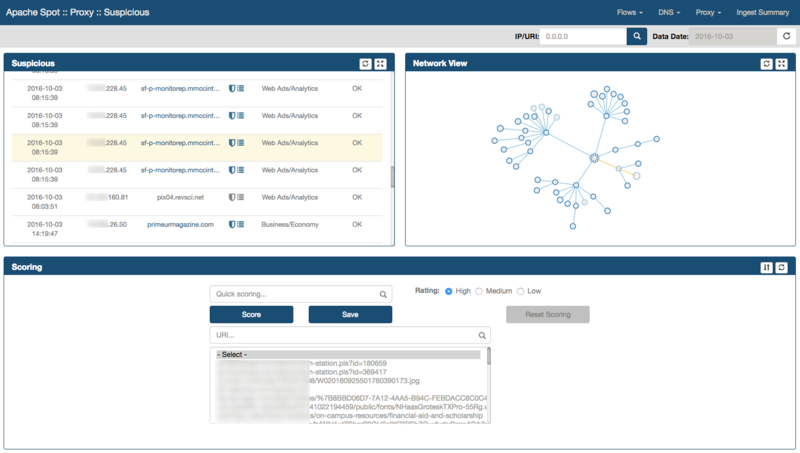 Access the analyst view for DNS Suspicious Connects. Select the date that you want to review. 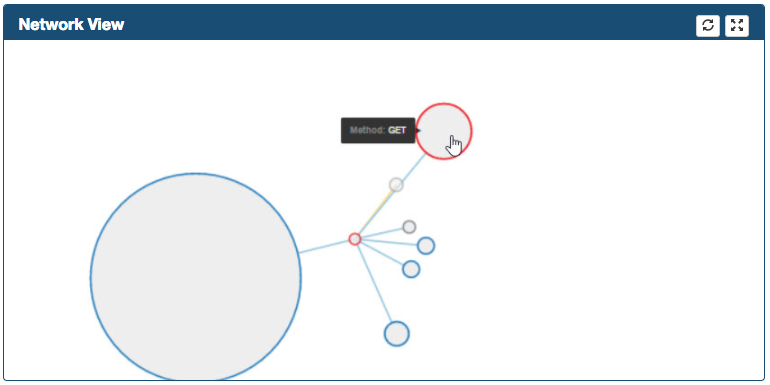 The analyst must previously score the suspicious connections before moving into Threat Investigation View, please refer to DNS Suspicious Connects Analyst View walk-through. Select DNS > Threat Investigation from Apache Spot (incubating) Menu. The query results will provide the different unique IP Addresses list that have queried this particular Domain, the list will be sorted by the quantity of connections. The expanded search will provide the different unique Domains list that this particular IP queried in one day, they will be sorted by the quantity of connections made to each specific Domain Name. The full output of this query is stored into the flow_threat_investigation table. Based on the results from this query, a table containing the results will be displayed with the following information. The quantity of results displayed on screen can be set by modifying the top_results variable. In addition, a web form is displayed under the title of 'Threat summary', where the analyst can enter a Title & Description on the kind of attack/behavior described by the particular IP or DNS query name address that is under investigation. Click on the "Save" button after entering the data to write it into the dns_storyboard table. At the same time, the charts for the storyboard will be created. Once you have saved comments on any suspicious IP or domain, you can continue to the Storyboard to check the results. Select the option DNS > Storyboard from Apache Spot (incubating) Menu. Your view should look something like this, pending on how many threats you have analyzed and commented on the Threat Analysis for that day. You can select a different date from the calendar. Executive Threat Briefing frame lists all the incident titles you entered at the Threat Investigation notebook. You can click on any title and view the additional comments at the bottom area of the panel. 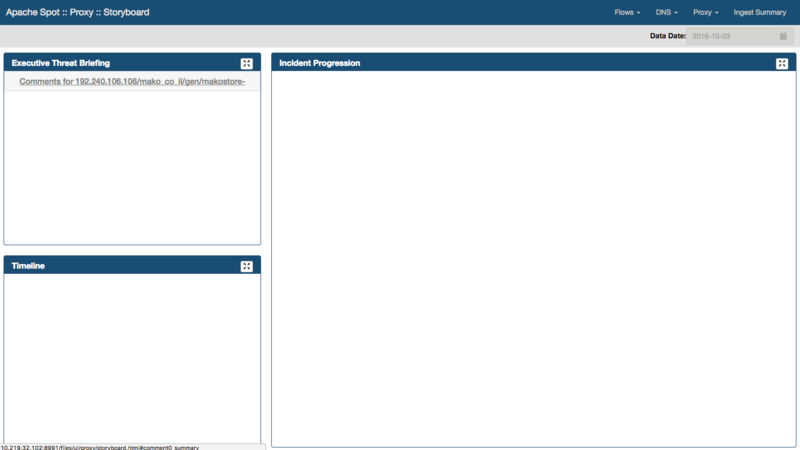 Incident progression frame is located on the right side of the Web page. 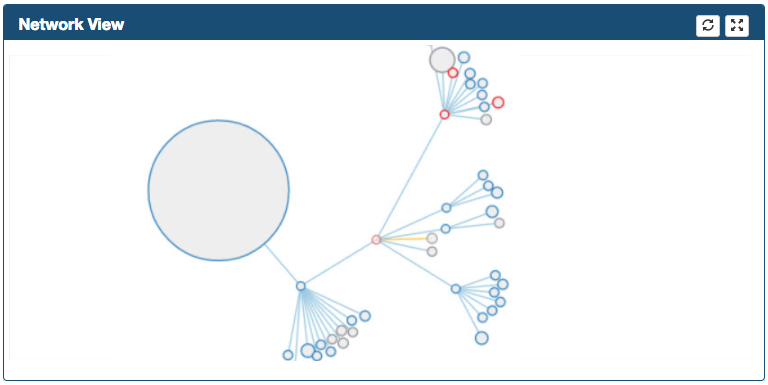 This will display a tree graph (dendrogram) detailing the type of connections that conform the activity related to the threat. Open the analyst view for Suspicious Proxy: http://"server-ip":8889/files/ui/proxy/suspicious.html. Select the date that you want to review (defaults to current date). Located at the top left of the Web page, this frame shows the top 250 Suspicious Proxy connections from the Machine Learning (ML) output. By moving the mouse over a suspicious Proxy record, you will highlight the entire row as well as a blur effect that allows you to quickly identify current connection within the Network View frame. The Shield icon. Represents the output for any Reputation Services results that has been enabled, user can mouse over in order to obtain additional information. The icon will change its color depending upon the results from the Reputation Service. 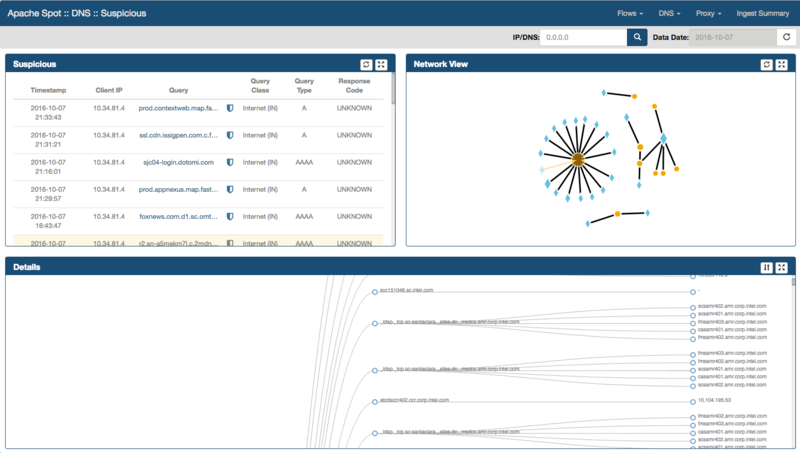 By selecting on a Suspicious Proxy record, you will highlight current row as well as the node from Network View frame. In addition, Details frame will be populated with additional communications directed to the same Proxy record. 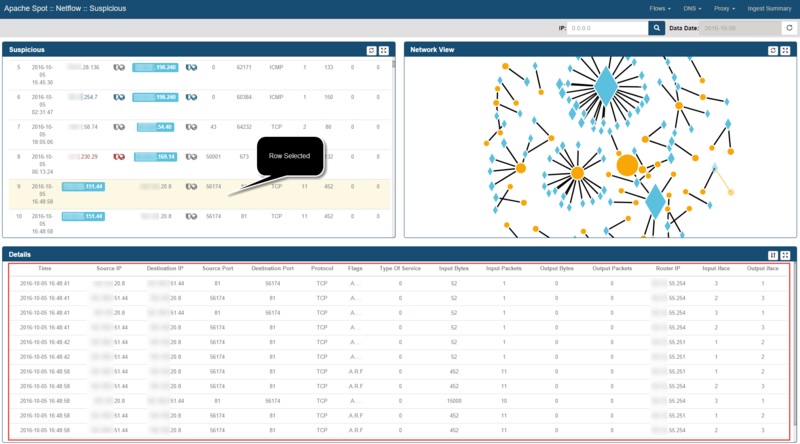 Located at the top right corner, Network View is a hierarchical force graph used to represent the "Suspicious Proxy" connections. Located at the bottom of the Web page. It provides additional information for the selected connection in the Suspicious frame. It includes columns that are not part of the Suspicious frame such as User Agent, MIME Type, Proxy Server IP, Bytes. This frame contains a section where the Analyst can score Proxy records with different values. In order to assign a risk to a specific connection, select the correct rating (1=High risk, 2 = Medium/Potential risk, 3 = Low/Accepted risk) and click Score button. Pressing the 'Score' button will find all exact matches of the selected threat (Proxy Record) in the proxy_scores table and update their score to the value selected in the radio button list. Access the analyst view for Proxy Suspicious Connects. Select the date that you want to review. 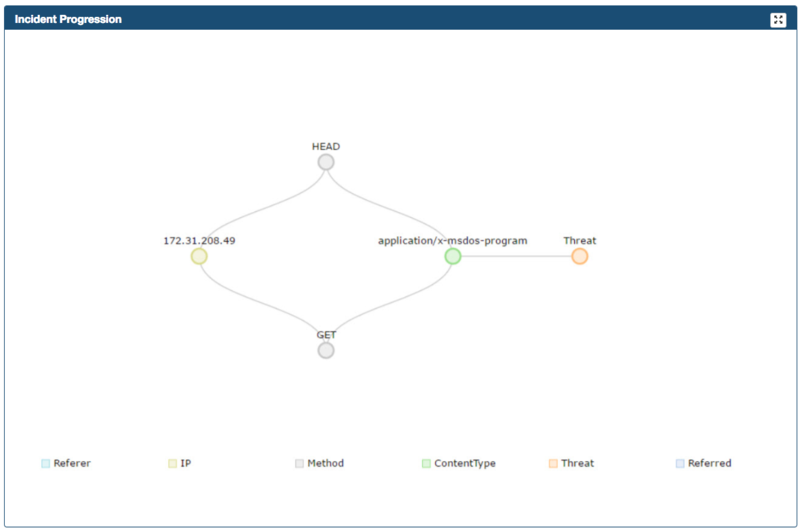 The analyst must previously score the suspicious connections before moving into Threat Investigation View, please refer to Proxy Suspicious Connects Analyst View walk-through. Select Proxy > Threat Investigation from Apache Spot (incubating) Menu. In addition, a web form is displayed under the title of 'Threat summary', where the analyst can enter a Title & Description on the kind of attack/behavior described by the particular Proxy Record that is under investigation. Click on the Save button after entering the data to write it into the proxy_storyboard table. Select the option Proxy > Storyboard from Apache Spot (incubating) Menu. Your view should look something like this, depending on how many threats you have analyzed and commented on the Threat Investigation page for that day. You can select a different date from the calendar. Executive Threat Briefing frame lists all the incident titles you entered at the Threat Investigation notebook. You can click on any title and view the comments at the bottom area of the panel. If multiple IP Addresses connects to a particular Proxy Threat (URL) you can scroll down/up, arrows indicate that there are more elements in the list. Timeline is created using the connections found during the Threat Investigation process. 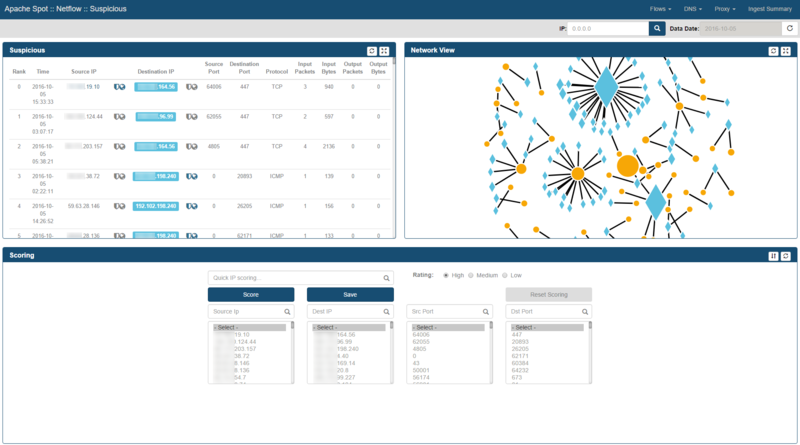 It will display 'clusters' of IP connections to the Proxy Record (URL), grouped by time; showing an overall idea of the times during the day with the most activity. You can zoom in or out into the graphs timeline using your mouse scroll. The number next to the IP Address represents the quantity of connections made from that particular IP to the Proxy Record in the displayed time. Perimeters Flows: Connections with external sites. Proxy: Intermediary Gate (If A/Client wants to ask for a service located in C/Server, it needs to be done by B/Proxy). 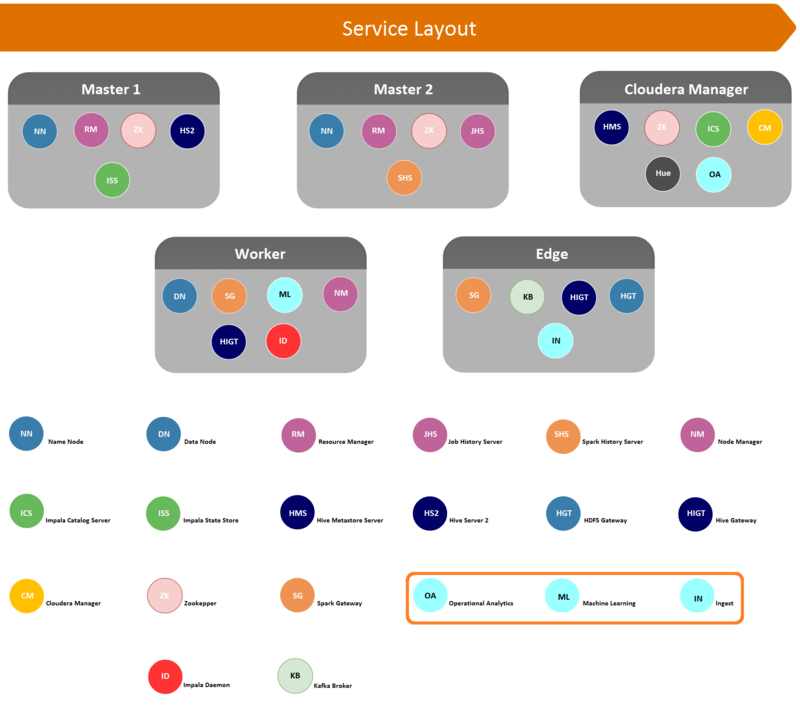 Internal Flows: When you are moving internally with lateral movements for example intranet (you are connected to a company network and you access to a server in this company). Telemetry: Automated analysis data process to collect, classify and filter information. Machine Learning: Component working as a filter separating bad traffic from benign and characterizing the unique behavior of network traffic. Hadoop Framework allowing distributed processing of large data sets across clusters of computers. Ad-hoc Search criteria to select specific sections generating a specific report. Netflow IP network traffic collection. MTTR: Reduction of mean time to incident detection & resolution. The Apache Hive data warehouse software facilitates reading, writing, and managing large datasets residing in distributed storage using SQL. Apache Impala (incubating) is the open source, native analytic database for Apache Hadoop. Impala is shipped by Cloudera, MapR, Oracle, and Amazon. The fundamental idea of YARN is to split up the functionalities of resource management and job scheduling/monitoring into separate daemons.